Pearlman playing Bach. What more could a music lover ask for? As a violinist myself I can only say that this is the best recording by far, of the Bach solos. I've been listening to it daily for several years now and I am more inspired with each listen. I'm running out of friends and relatives to give this CD set to! 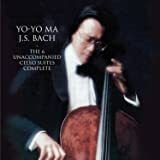 Is this the Bach collection for baroque purists? Of course not. Nor will it please the lovers of the old-school romantics. However, it is a superb collection if approached on its own merits. Nobody can fault the sound on these CDs, it is just simply wonderful. 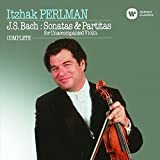 It is also clear that Perlman does not approach unaccompanied Bach lightly --- two full decades of recording passed before he felt confident to record these works, and his respect and love for Bach comes through with every note. 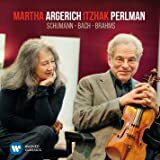 Whether or not you approve of the use of vibrato, it is obvious that Perlman has carefully thought through every bit of phrasing. The result is very satisfying, and the musical ideas flow comfortably from one passage to the next. I don't find the vibrato to be a distraction --- and let's face it, all of us who play unaccompanied Bach throw a little vibrato in there from time to time. This is a far cry from some of the grotesque, turn-of-the-century romantic parodies of Bach, where the vibrato and phrasing nearly obliterates Bach's original structure. Listen to how Perlman puts together these pieces. He is not guilty of romantic self-indulgence here. Compare it to Milstein and Szeryng if you must. I believe that Perlman holds his own here. He certainly has produced the best Bach collection in the last 30 years, no doubt. 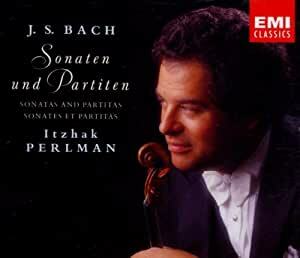 Both my parents were accomplished violinists and I grew up listening to both play Bach's sonatas and partitas. So of course, the work was already familiar and loved. 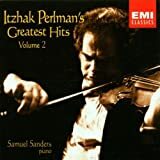 Perlman is arguably one of the best violinists ever so purchasing this recording was a no brainer. It is absolutely beautiful. 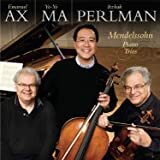 the technical quality of the recording is impeccable to where if you have a decent set of headphones and you close your eyes, you can actually hear the bowing details that Perlman uses. 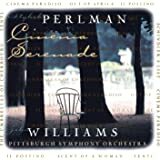 The phrasing and interpretation is beautiful -- of course, the Chaconne is my favorite and Perlman does an incredible job managing the many dynamic moods associated with the piece. If you love violin and know violin, this is a collection that you can not simply put on in the background to play while you are doing something else... it is something that you will want to focus all your attention on just as if you were going to a live recital. You will hear all the subtleties that is the genius of Bach. To me, Bach Sonatas and Partitas are proof that God exists and -- no set of notes could have been set down without some sort of divine inspiration.